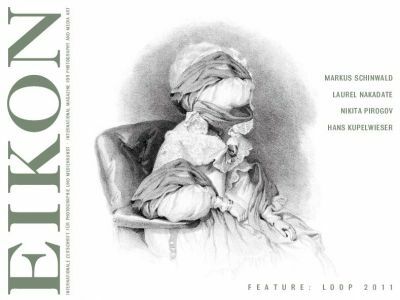 Insiders might remember the founding of this journal in 1991 when Carl Aigner was able to make a dream come true, creating with EIKON a platform for photography and media art that is today considered one of the most important around the world. Over the last two decades, dramatic changes have taken place in these realms, and we have always been there to report on them. So with this issue we do not intend to provide a celebratory issue, but rather, just as we have aimed to do in each individual issue, we seek to provide an interesting survey of the subject. Once again, a special feature of the issue are the works in our Artist Pages, presenting HANS KUPELWIESER, LAUREL NAKADATE, NIKITA PIROGOV, and MARKUS SCHINWALD. The latter was invited by commissioner Eva Schlegel to create an installation for the Austrian pavilion at this year’s Venice Biennale; you can read her thoughts on choosing this artist in our Forum. When in the fall of 2010 young Russian artist NIKITA PIROGOV was in Vienna for anika handelt’s International Portfolio Review, he was chosen by the experts on the jury as the most exciting newcomer. As a prize for this event—now a standard—EIKON publishes a main feature on the winning artist. With HANS KUPELWIESER, we pay tribute to an artistic position that wanders across various disciplines, in so doing granting the photographic medium an essential role. This summer issue’s Artist Pages section is completed by a contribution on video and photography artist LAUREL NAKADATE, whose work is being exhibited at MoMA’s PS1 until August. The medium of video is also the focus of the extensive feature on Loop, the annual Barcelona video fair and festival. This year photography gallery WestLicht is celebrating 10 years since its founding, while Galerie Hilger is already celebrating 40 years. EIKON congratulates both, and dedicates two contributions to these important institutions, the latter in the rubric Art Market. We saw the twentieth anniversary of our founding as an occasion to expand our expertise and to establish a photography advisory board consisting of Carlos Durán, Ulrich Haas-Pursiainen, and Artur Walther, who define their activity in the following pages.